To be honest, Siem Reap is a small town. Because it is the gateway to the Angkor Temples, it has many more than its fair share of excellent restaurants and hotels, but when you live here for a while, it can all start getting a bit repetitive. On Sundays, we like to do something different, either go for a drive in the countryside or check out something we’ve been curious about. One such curiosity has been a large pagoda complex situated along National Road 6 on the way to the airport and points north. I’ve passed it hundreds of times over the years and I’ve often wondered about it. 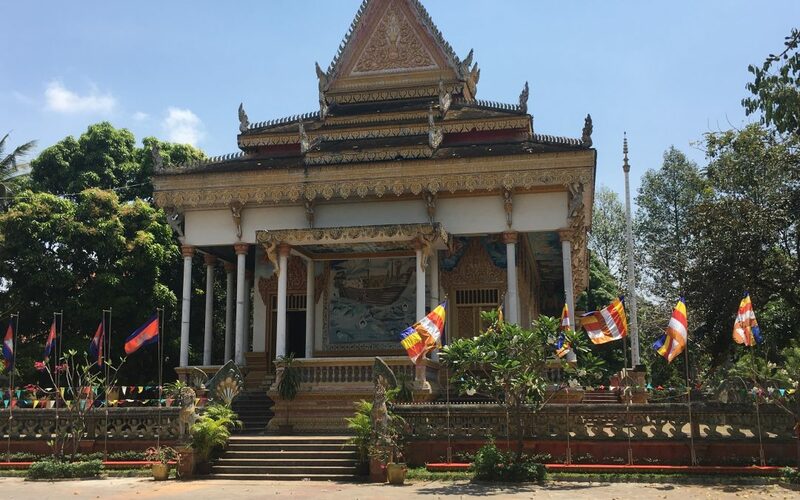 It’s very incongruous, sitting there in all its golden glory, nestled between the big hotels full of Chinese and Korean tourists, industrial-sized restaurants and outposts of Khmer commerce. To me, ‘airport roads’ are the same the world over. They are highways full of industry and low-end residential developments that whizz by the multi-lanes of traffic. National Road 6 is no different, especially in the first kilometres outside of town. The traffic is just as bad, except here it is full of motos and tuk tuks as well as cars and trucks. 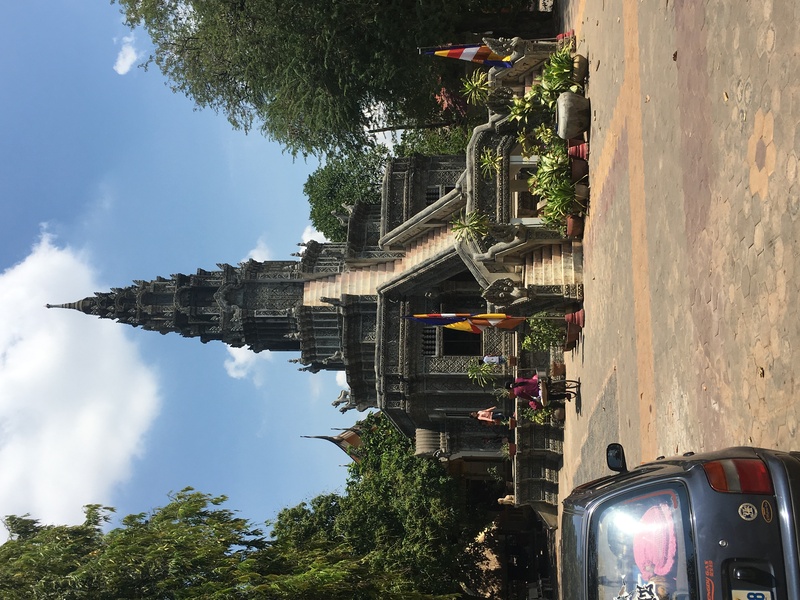 So the pagoda looks especially strange as you drive past it, tucked between the enormous Sokha Hotel and a run-down primary school. National Road 6 is also not a road you would choose to take a leisurely stroll along. But that’s what we did on Sunday. Given the temperature was in the high 90’s and the humidity just as high, the stroll had to be leisurely. But it was worth it to discover Wat Kesararam. The main pagoda in Wat Kesararam is called The Pagoda of the Cornflower Petals. It was built in the early 1970’s, just a couple of years before the Khmer Rouge marched into Phnom Penh to start their reign of terror. The first thing you see as you walk through the gate is a huge stupa which looks like it is literally piercing the sky. A few local kids were playing hide and seek up its stairs. This is definitely not on the tourist trail. As we walked round we found a religious community going about the business of its day. A ceremony was happening off to the side. We didn’t want to intrude so I’m not sure what it was all about, but the music was unmistakeable and provided a beautiful backdrop to our wanderings. Inside the temple itself are brightly painted frescoes depicting the life of Buddha, and of course, a larger than life-size statue of him. The exterior walls are also brightly colored with scenes of horror and glory. All in all, a wonderful oasis of calm and art minding its own business alongside one of the busiest highways in the country. As I’ve always said, Cambodia is a country of contrasts.